William Scheier died last year at Goodyear's Danville, Va., plant when the cutting wheel on this Alpha Shear machine surged toward him, pinning him down. William Scheier followed what he thought were company rules. And it cost him his life. 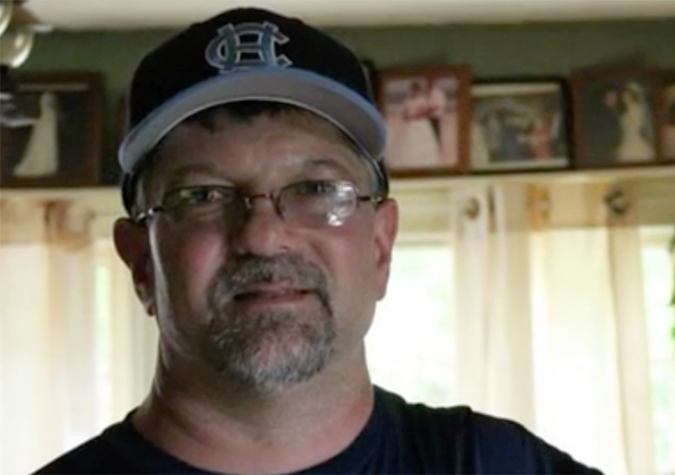 The 47-year-old electrician spent about six years working at Goodyear Tire & Rubber Co., so he could move out of his trailer and build a three-bedroom home in Virginia for his wife and teenage son. They had lived there just two months when Scheier strode onto the shop floor one August morning last year with a screwdriver and set to work on the Alpha Shear. The giant machine cuts rubber for tires bearing Goodyear’s distinctive winged-foot motif. State and federal workplace safety standards require machines to be shut down when they’re being repaired. But that wasn’t always how the company’s plant in Danville, Virginia, operated, records show. William Scheier, a 47-year-old electrician, left behind a wife and teenage son when he died at Goodyear’s plant in Danville, Va.Credit: Courtesy of Powell Funeral Home Inc. 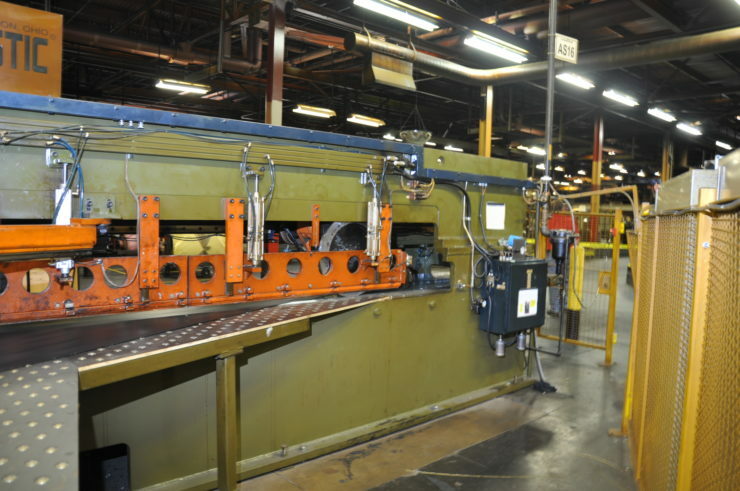 The Alpha Shear was not shut down when Scheier leaned into the machine to adjust a switch, Virginia workplace safety records show. Moments later, the cutting wheel on the machine surged toward him, pinning him down. His chest was badly bruised. Blood spurted from a puncture wound under his left arm. Emergency responders performed CPR but failed to revive him, a police report shows. Five workers have died in Goodyear plants since August 2015. Four of those workers were killed in Goodyear’s plant in Danville, while the fifth was struck in the head by a falling object and died at a plant in Topeka, Kansas. The tire giant is among the deadliest manufacturers in the nation for workers, according to a recent investigation by Reveal from The Center for Investigative Reporting. 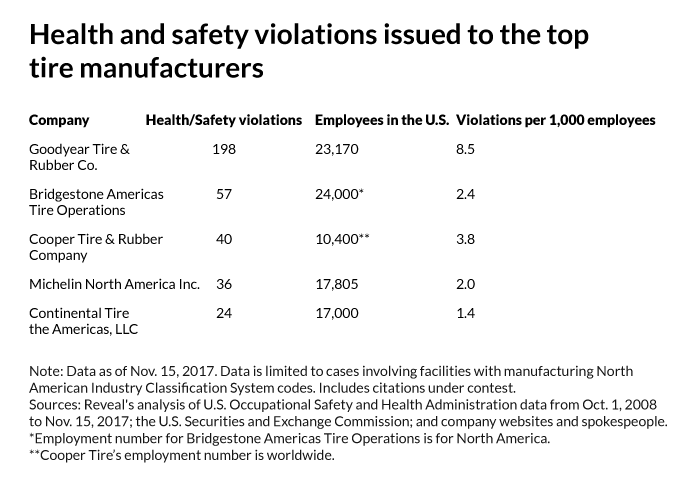 Since October 2008, Goodyear has been fined more than $1.9 million for nearly 200 federal and state health and safety violations, far more than its four major competitors combined. At least four motorists over the last seven years have died in accidents after tires made at Goodyear plants failed. Tires involved in these accidents were manufactured in Goodyear plants in Fayetteville, North Carolina, and Danville, Virginia, where intense production demands and leaks in the roof during storms have endangered workers and consumers, according to Reveal’s investigation. Reveal examined hundreds of documents from seven states and interviewed dozens of current and former Goodyear workers during its investigation. Soon after Scheier’s death, Virginia safety inspectors arrived in Danville. But when investigators asked Goodyear officials to temporarily turn off the cutting machine that killed Scheier, the answer was unequivocal, according to investigators. “It would interfere with production,” a company safety manager told them. Investigators again pressed company supervisors a week later. But the company’s lawyer intervened and again refused to shut down the machine. So state officials obtained a search warrant – requested in just a fraction of fatality investigations, regulators say. Ellis Jones, Goodyear’s senior director of global environmental health, safety and sustainability, said the company does not prevent workers from shutting down machines or place production before safety. Plant supervisors and union contracts instruct that “every member, every associate has the right to shut down a piece of equipment if they feel they’re in an unsafe condition,” Jones said. However, during their investigation, state workplace safety inspectors found “Goodyear’s written procedures failed to fully lock out the alpha shears.” In addition, many workers said “they had never seen machine specific” procedures, investigators reported. Despite what the records show, Jones insisted that the company did not obstruct investigators. They were given “immediate access to the facility and the equipment,” he said. “As far as I know, (the Occupational Safety and Health Administration) is very pleased and the state is very pleased with the progress that we’ve made and the cooperation of the team in Danville,” Jones said. Over the years, Goodyear managers have acknowledged workplace safety lapses they had known about but ignored, such as failing to shut down machines before assigning employees to repair them, OSHA investigators and police have found. “The employer and employee stated that they routinely check electrical issues without utilizing lockout/tagout,” OSHA investigators wrote. Jones declined to comment on this case, saying he was unaware of its specific details. Families of the dead and injured have little recourse. With few exceptions, workers injured on the job in Virginia and other states cannot sue their employers. That leaves them to turn to the workers’ compensation system, which provides meager payouts. The publicly traded company provides tires to clients ranging from the U.S. military to Boeing. It reported $1.3 billion in net income last year. Goodyear agreed to pay $986,600 and acknowledged it willfully violated two rules and seriously violated 15 others in the August 2016 accident that killed Scheier.